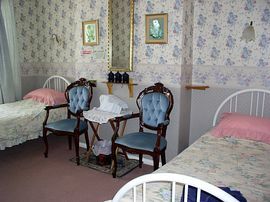 Most of our rooms are en-suite, and all rooms contain washbasin, colour TV, tea/coffee facilities and hairdryer. Free parking is also available. A short stroll along the attractive tree-lined street of Bootham will bring you to York Minster and the city centre. Alternatively, you can walk to the city from here via the Museum Gardens, or along the river Ouse. 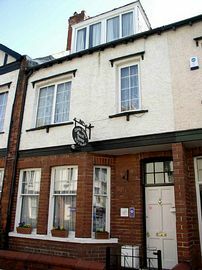 York is a very compact city, and all the attractions are within 5 - 20 minutes walk from the Guest House. Less than 10 minutes walk from the city centre. Guests provided with front door key. Disabled Facilities: There are no disabled facilities. Ground floor bedroom suitable for people with restricted mobility. Please note that the premises are not suitable for those who are confined to a wheelchair. Special Diets Provision: Special diets are catered for. Vegetarian options always available. We will endeavour to cater for special diets by prior arrangement. Smoking Facilities: Smoking is not allowed. Strictly non-smoking establishment. Take the A64 (York/Leeds) towards York. Ignore all signs to York until you see the A1237 (outer ring road). Take this road, and go straight ahead at the first four roundabouts. At the fifth roundabout - signposted A19 (York/Thirsk), * turn right towards York. After approximately 2 miles, you will come to a set of traffic lights (just after a church on your left) - go straight ahead at these lights and look for a footbridge which spans the road. Queen Anne's Road is the next turning on your right. At Boroughbridge, take the A59 to York, turn left onto the outer ring road(A1237). At the second roundabout - signposted A19 (York/Thirsk) follow the instructions from * above. Drive into the centre of York. After you pass the Mecca bingo, get into the right hand lane and turn right onto the inner ring road. You will pass the Barbican centre on your right, and the city walls will be on your left. Go straight ahead at the next four sets of traffic lights. At the fifth set of lights, enter the left hand lane and turn left into Gillygate. Turn right at the next set of lights, onto Bootham. Queen Anne's Road is the fourth turning on the left hand side off Bootham. Turn left out of the station forecourt and keep walking straight on at the first set of traffic lights; the road will take you underneath the city walls. Keep bearing left and you will cross a bridge over the river. After crossing over the bridge, you will see the entrance to the Museum Gardens on your left hand side - walk straight through the gardens and at the other end, look across the road and slightly to your left. You will see a small lane called Marygate Lane. Cross over the road and keep walking down the narrow lane ahead of you. Queen Anne's Road is the next road on your right hand side, and we are situated approximately one-third of the way up on the right hand side. There is a shortcut, however this involves negotiating several steps up and down over the railway bridge. Turn left out of the station forecourt, at the first set of lights turn left. You will pass the Royal Mail sorting office on Leeman Road. Cross over the road and take the small lane at the end of the sorting office which leads to the river. Cross over the railway bridge and follow the path which runs parallel with the railway line (large car park on your right hand side). Turn left underneath the railway line and follow the instructions from * above. Walk towards city walls, turn right at the traffic lights and you will cross a bridge over the river. You will see a small lane called Marygate Lane. Walk down the lane, passing a large car park on your left hand side, and carry on underneath the railway line. 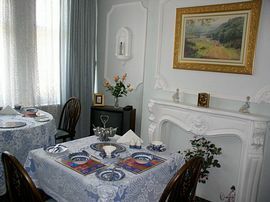 From £26 to £34 per person per night. We are open all year round, apart from Christmas Eve, Christmas Day and Boxing Day.